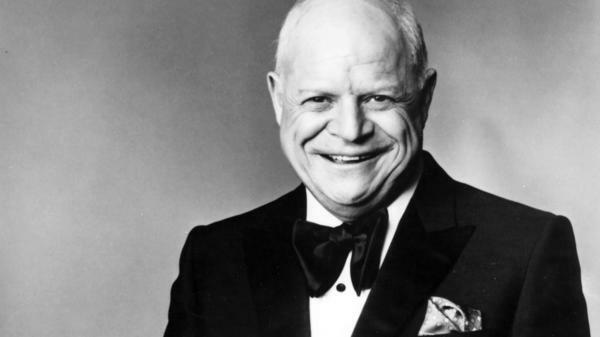 Don Rickles was jokingly known as "The Sultan of Insult." He wouldn't be able to get away with it in quite the same way today, but from the 1950s on, Rickles had a simple, successful recipe. Be merciless and spare no one: "That's all Jews do, sit in their underwear, belch, and watch TV," he told one audience. "The Irish guys are staggering around; the colored guys are going, 'Glory, glory hallelujah'; the Mexicans, 'I'm going to the toilet, I don't care what the colored guys do.' And the queers are going, 'Let's go to the park and have a love-out.' "
"Oh, it's very offensive, but not if you're into comedy," comedian Chris Rock said in the 2007 documentary Mr. Warmth: The Don Rickles Project. Rickles didn't use four-letter words — back then that would've been more transgressive than racial and ethnic stereotypes. For personal invective, he called people dummies and hockey pucks. And when people heckled him in clubs, he shot right back: "Where you from, tiny? Alabama — that's trouble boy, that's trouble. What's your first name? Rufus? Usually from the South they have those flukey names like Booker T. Abraham, Isaac Aloysius Whiteman, Kiss My Sink Alabama Harry." Rickles was born in Queens, N.Y., in 1926, the son of Lithuanian Jewish immigrants. He served in the Navy during World War II and then began to pursue comedy full time, working East Coast nightclubs and burlesque houses. His career took off in the late 1950s and '60s thanks, in part, to his friend and longtime supporter Frank Sinatra. Rickles was the Rat Pack's court jester — Sinatra once appeared on The Tonight Show telling a legendary story about an incident in a restaurant, something no one but Rickles could've gotten away with. "He came over to the table and he said, 'Frank, do me a favor, will you? I'm sitting with a very pretty girl and, uh, I'm trying to make out, you know,' and he said, 'I told her I know you and she really doesn't believe me. Would you stop by the table?' And I said all right, I was just about finished, and I walked by the table and I said, 'How are ya, Don? Nice to see you.' And he said, 'Can't you see I'm eating, Frank?' "
Rickles became a Las Vegas fixture at Rat Pack hangouts like the Sands Hotel, where every audience became a target. In 1968 he recorded a best-selling comedy album live at the Sands called Hello, Dummy. And in Hollywood, being insulted by Rickles was a compliment. His most memorable — and ubiquitous — performances were on late-night talk shows. For decades, Johnny Carson, Jay Leno and David Letterman relied on Rickles' ability to tickle viewers with his infinite arsenal of zingers. Rickles also acted in dozens of movies and TV shows and provided the voice of Mr. Potato Head in the Toy Story movies. There was always a sentimental side to Don Rickles. Not convinced? Then consider this, ya hockey puck, from that album Hello, Dummy: "Will Rogers once said, 'I never picked on a little guy, only big people.' May I say to this entire audience, on a hectic night, you are pretty big and I do thank each and every one of you." Rickles wanted everyone to know that his insults were all in fun — but let's face it, it's the insults we're remembering. Ya hockey puck. Before Comedy Central's celebrity roasts, before American Idol's Simon Cowell, before Triumph The Insult Comic Dog, one man abused people on TV and in clubs like no other. UNIDENTIFIED MAN #1: Ladies and gentlemen, here is the sultan of insults, the merchant of venom, the pussycat with claws, Mr. Don Rickles. MCEVERS: Comedian Don Rickles died today at age 90. NPR's Ted Robbins has this look at Rickles' long career. TED ROBBINS, BYLINE: He couldn't get away with it in quite the same way today, but from the 1950s on, Don Rickles had a simple successful recipe. Be merciless, and spare no one. DON RICKLES: That's all Jews do - sit in their underwear, belch and watch TV. RICKLES: The Irish guys are staggering around. The colored guys are going (singing) glory, glory, hallelujah. The Mexicans - I'm going to the toilet; I don't care what the colored guys do. And the queers are going, let's go in the park and have a love-out. CHRIS ROCK: Oh, it's very offensive but not if you're into comedy. ROBBINS: That's comedian Chris Rock in the 2007 documentary "Mr. Warmth: The Don Rickles Project." Rickles didn't use four-letter words. Back then, that would have been more transgressive than racial and ethnic stereotypes. For personal invective, he called people dummies and hockey pucks. And when people heckled him in clubs, he shot right back. RICKLES: Where you from, tiny? RICKLES: Alabama - that's trouble, boy. That's troubling. RICKLES: What's your first name, Rufus? ROBBINS: Don Rickles was born in Queens in 1926, the son of Lithuanian Jewish immigrants. He served in the Navy during World War II, then began to pursue comedy full-time, working east coast nightclubs and burlesque houses. His career took off in the late 1950s and '60s thanks in part to his friend and longtime supporter Frank Sinatra. Rickles was the Rat Pack's court jester. Here's Sinatra on "The Tonight Show" telling a legendary story. No one but Rickles could have gotten away with this. It happened between them at a restaurant. ROBBINS: Rickles became a Las Vegas fixture at Rat Pack hangouts like the Sands Hotel where every audience became a target. In 1968, he recorded a best-selling comedy album at the Sands called "Hello Dummy!" RICKLES: Don't scratch, Sir. It clears right up. There's a new thing out called soap and water. ROBBINS: In Hollywood, being insulted by Rickles was a compliment. His most memorable and ubiquitous performances were on late night talk shows. For decades, Johnny Carson, Jay Leno and David Letterman relied on Rickles' ability to tickle viewers with his infinite arsenal of zingers. ROBBINS: Don Rickles acted in dozens of movies and TV shows. He did the voice of Mr. Potato Head for the "Toy Story" movies. RICKLES: (As Mr. Potato Head) Oh, you're a sight for detachable eyes. ROBBINS: There was always a sentimental side to Don Rickles. Not convinced - then consider this, you hockey puck, from that album "Hello Dummy!" RICKLES: Will Rogers once said, I never picked on a little guy, only big people. May I say it to this entire audience on a hectic night. You are pretty big. And I do thank each and every one of you. ROBBINS: Don Rickles wanted everyone to know that his insults were all in fun. But let's face it. It's the insults we're remembering. Ted Robbins, NPR News. (SOUNDBITE OF SANTO AND JOHNNY SONG, "SLEEPWALK") Transcript provided by NPR, Copyright NPR.